The Wisconsin man, 24, allegedly became so incensed by a lackluster karaoke performance of a heavy metal song that he assaulted the singer and a second man, police charge. 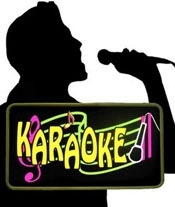 According to a River Falls Police Department report, Drinkwine throttled singer James Mischler, 28, and his friend Cyrus Kozub, 29, "over one's ability to sing karaoke." Though cops did not specify which song set Drinkwine off last week, Kozub told TSG that Mischler was performing "Holy Diver," the title cut on Dio's 1983 debut album (the band is fronted by Ronnie James Dio, the former Black Sabbath lead singer). Following the assaults, police apprehended Drinkwine after a short foot chase. A subsequent Breathalyzer test recorded his blood alcohol content at .169, more than twice the state limit. Drinkwine was booked into the Pierce County Jail on battery and disorderly conduct counts. He is pictured in the above November 7 mug shot snapped in neighboring St. Croix County, where he was charged with violating probation on a prior case. Though Drinkwine declined to speak with cops following his arrest, an officer overheard him, during a jail phone call, tell a friend he "fucked up" and was arrested for fighting.